My teacher Gary Kraftsow often says: “You can’t teach what you don’t have”. This means that to be effective yoga teachers, we need to practice our own yoga. 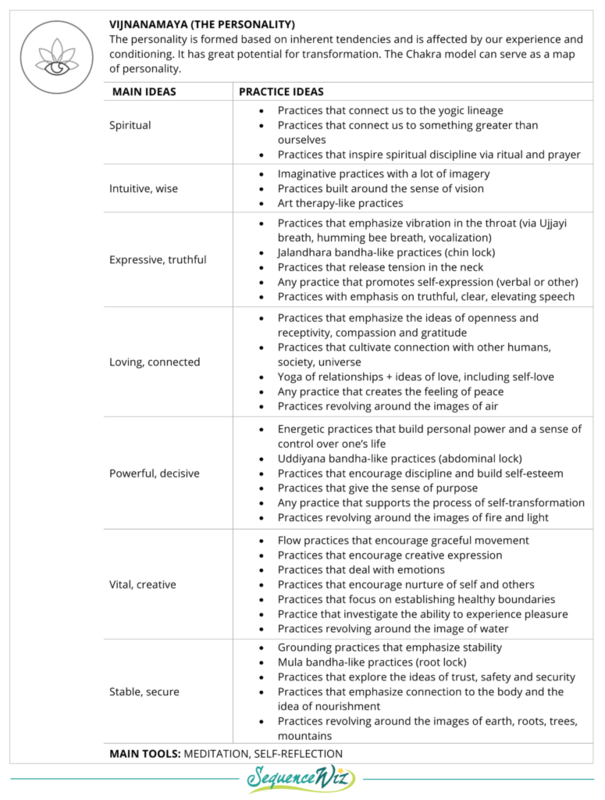 If you have an interesting, rich and multidimensional personal practice, this will inevitably come across in your teaching. But if the well of your own yoga practice runs dry, this will leave your students thirsty as well. 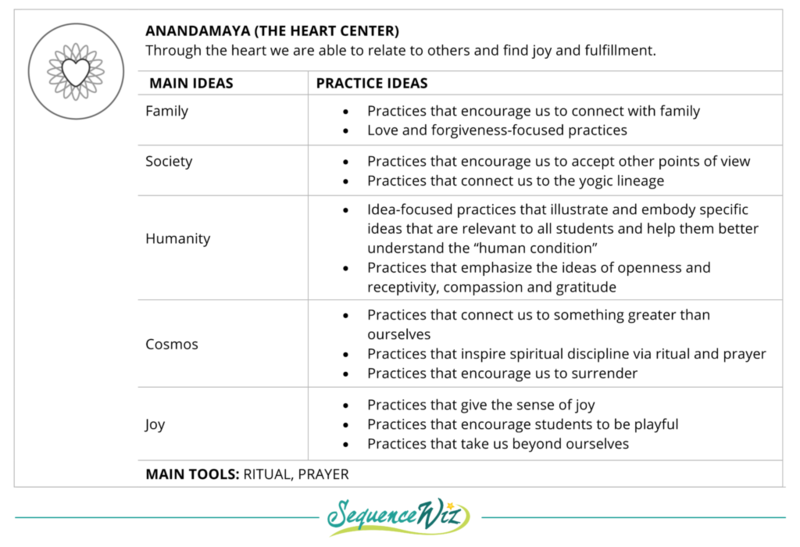 As we mentioned last week, the most effective approach to teaching yoga is “Study it – practice it – teach it.” And being human, you will only be able to keep your studies going for a long time if you are personally interested in what you are studying. So what interests you right now? Do you want to experiment with some specific postures? Are you dealing with hip tension? Are you challenged by some other personal struggles that you want to address? Your yoga practice has room for all of it. You can investigate it all in your practice, and then pass the lessons you learn to your students (and give them room to investigate, as well). Each one of us is a multidimensional human being who has all sorts of needs beyond strictly physical. 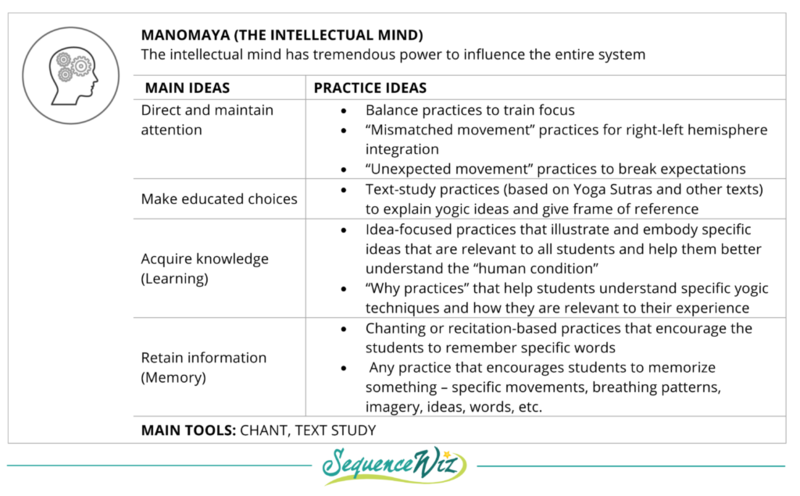 So today I will show you how you can use the Panchamaya Model to envision different kinds of practices for your students. This is in no way an exhaustive list of what’s possible, but a comprehensive overview that is meant to spark your creativity and encourage your own exploration. 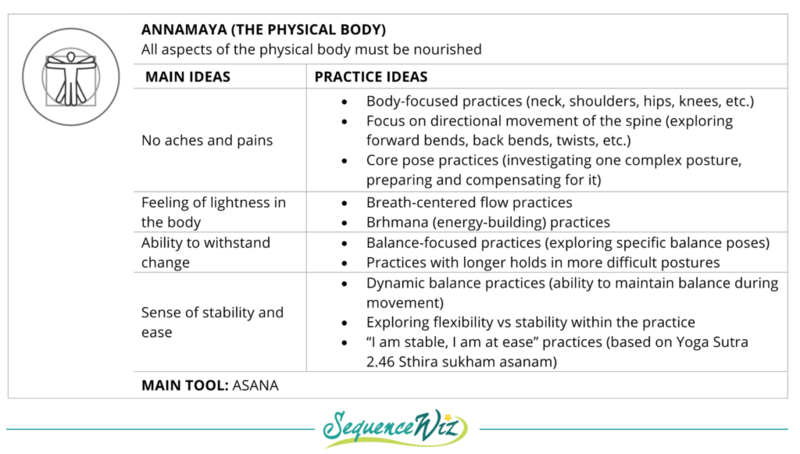 Sequence Wiz members can find a pdf handout of Yoga Practice Ideas Based on the Panchamaya Model on their account homepage under Forms and Handouts. Thank you Olga for a very comprehensive insight into the Panchamaya model and how to apply in our practice. Really enjoyed reading it and will be more aware now of including each element in my practice and teaching. That is wonderful to hear Dan! 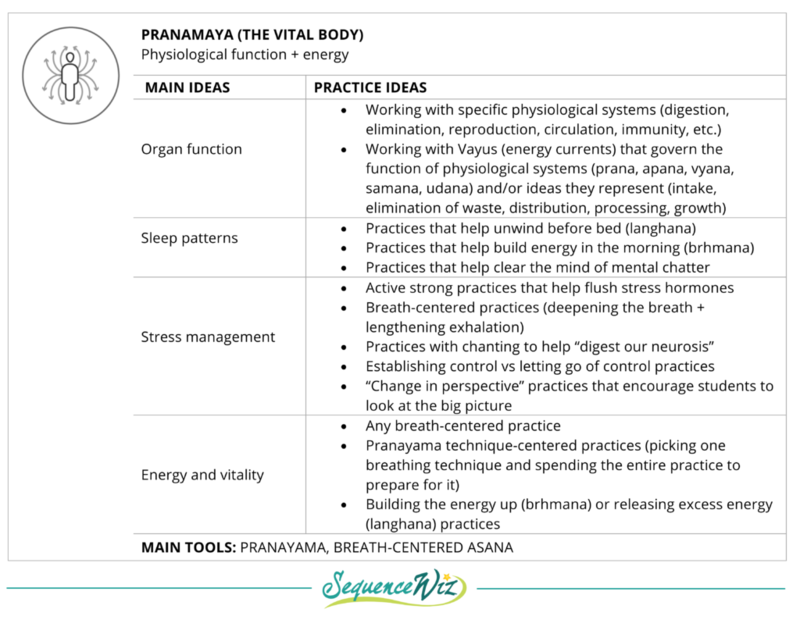 I love to use the Panchamaya model to organize my thoughts and teaching strategies. 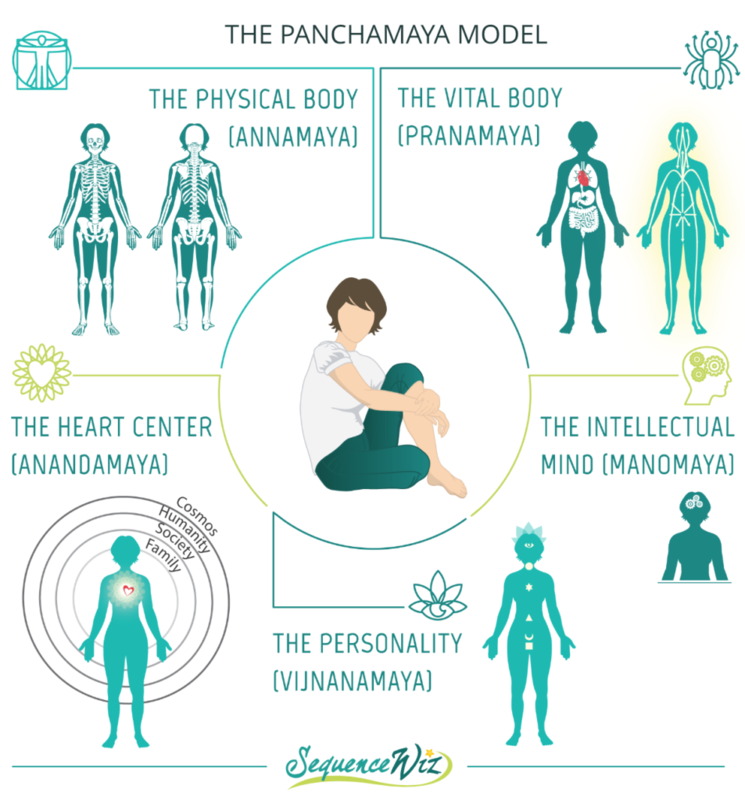 Pretty much everything we learn in yoga fits somewhere within the Panchamaya Model because it is meant to address some aspect of our human experience. Once you get a more clear picture of where everything fits, it makes it much easier to make specific choices and stay on track. And I am so excited to hear that are giving thought to what you plan to offer to your students – it goes back to that fundamental idea of having a clear intention, super important! This is such a cool post…..at first I wasn’t sure what I was supposed to follow (my fault) and then I read through the entire post. It’s so full of information to use with my students. My class today was centered on balance…life, nutrition, breath, asana. I wish I had seen this first! Thank you!